The Chaos Dwarf Battlefield is a small cave connecting Keldagrim and the Red Axe produces Chaos Dwarves, it is introduced with the Forgiveness of a Chaos Dwarf quest. After the quest, The Black Guards battle the Chaos Dwarf forces to prevent invasion to the Keldagrim mines. It is located at the Southwest corner of the city hidden by a gold ore vein. This area was simply an empty opening which is used during the quest Forgiveness of a Chaos Dwarf. However, be aware that the area, after the quest, becomes dangerous if not well prepared as it's filled with potentially aggressive monsters. For the other parts, anything is fine as long as a high stab attack bonus and a high crush defence bonus is maintained. For the other parts, anything is fine as long as a high magic defence bonus is maintained. Your inventory should look like this. Not much food is needed because the monsters seldom fight back. The Protect from Ranged prayer is a must in case the cannoneers fight back, so a few prayer potions is recommended. A stock of quick ranged weapon such as darts and knives would be helpful for dealing damage to dying monsters for drops, while rangers can treat them as extra ammo. Summoning familiars are not recommended unless you are using a Bunyip or a Unicorn Stallion for their healing ability. A one-click teleport to escape is important. If you have portals and an altar at your house, a House tab is recommended, if not, use a Lumbridge tab or Ectophial. Leave more than 10 empty spaces since the drops are of different variety. 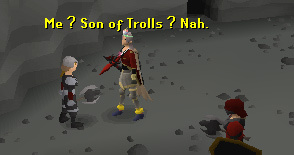 Warning: Avoid wearing Zamorak or Saradomin items as they may sometimes result in aggression of the opposing sides. This includes Holy Symbol, God Books and other equipment. Chaos Dwogres which use a Crush attack when you're nearby and a magic attack when you are out of his melee range is the main monster that you will encounter within. If using the prayer method, you will only be fighting Chaos Dwarf Cannoneers and Chaos Dwarves. Note: This guide will lead you to avoid aggression of other monsters in the area if you choose the Melee or Ranging method. Make sure you have a decent Defence level. 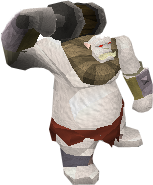 Wear Guthan's Armour if you are planning to melee, and Black Dragonhide if you plan on ranging. The crush Defence of Guthan's Armour is fair and its ability to heal is very useful for a long stay. Black dragonhide is known for its magic Defence, a mind or a body shield is good if you need extra magic Defence. Barrows armour completely degrades when appeared under a gravestone. 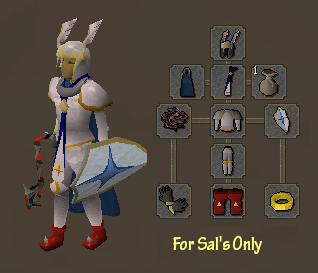 Before you're familiar with the place, wearing Rune armour would be a good alternative. However, wear a chainbody as it provides a greater crush Defence bonus. If using the melee or prayer method, bring a Hand Cannon Shot with you to save an inventory space. Note: A Ring of Wealth does not affect the drop rate of Hand Cannons, Hand Cannon Shots and Dragon Pickaxes. One can travel to Keldagrim by the cart system or the train system and then travel on foot to the west side of Keldagrim, however, this is extremely inconvenient and is not recommended. Getting to the Chaos Dwarf Battlefield by entering Keldagrim through the main entrance is the fastest access. A quick access to the battlefield is very important when you are not familiar with the place as death is not uncommon. Although this guide will tell you all the important things to notice, it is still recommended. Via The Fairy Rings: The Fairy Rings (Code DKS , Snowy Hunter Area) can teleport you to 1 click away from the Keldagrim Entrance. Via The Mine Carts System: Climb in the trapdoor at The Grand Exchange and walk to the West side of the city. Once you are inside Keldagrim, talk to the Boatman to cross the river. Walk west and you will find yourself in front of a cave opening, before you go any further, activate the Protect from Ranged prayer since there is a glitch that sometimes you will be swarmed by the inhabitants even without making them aggressive. Inside the dungeon you will see the Black Guard battling the Red Axe, the entire area is multicombat and both sides will become aggressive when one of them is attacked. Note: The Chaos Dwogres at the far west of the battlefield are never aggressive and attacking them will not result in aggression from the Red Axe side. All monsters of the Red Axe side are known for dropping the Dragon Pickaxe with a slim drop rate of approximately 0.05%. Apart from the Dragon Pickaxe, the Chaos Dwarf Hand Cannoneers drop the Hand Cannon, which is rare, and Hand Cannon Shots, which are fairly common. 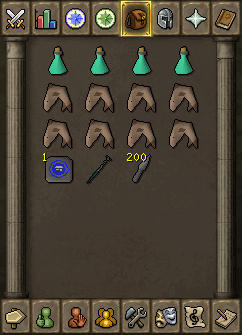 Green Charms are also very common drops by Chaos Dwogres, which makes killing of the Red Axe side more profitable than killing the Black Guard side. A tactic to survive in the area for a long period of time is to attack the Chaos Dwogres for 20-25 minutes before killing Chaos Dwarf Handcannoneers and Chaos Dwarves. It is unknown if this is intended or a glitch, if you are too near from the west opening of the battlefield, all monsters will become aggressive. 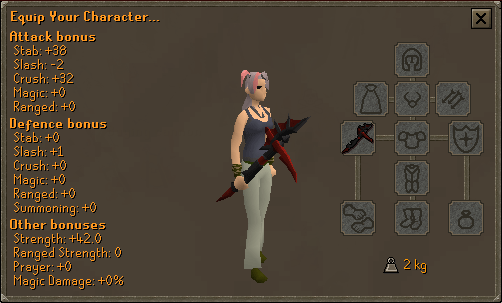 Wearing god items of Zamorak will make the Black Guard side aggressive when you enter, watch what you equip! Another glitch. After staying for around two hours, all monsters may become aggressive any time, keep track of the time. As stated previously, make sure you have activated the Protect From Ranged prayer before entry. If you are safe inside, you can turn it off unless you are using the prayer method. It is suggested to set the Protect from Ranged prayer as your Quick Prayer for safety. If you're using the Melee and Ranging method, you should only kill Chaos Dwogres for the first 10-15 minutes. After that, kill a black guard to see if the whole Black Guard side becomes aggressive. If they are not tolerant of you yet, leave the battlefield, change world and try again. Testing your tolerance on Chaos Dwarves is dangerous since Hand Cannoneers can hit over 300. Try to stay further from the west side to avoid being piled. This place is similar to the God Wars Dungeon. That is, if you have dealt even the slightest damage of 1 Lifepoint, any drops from that monster are yours. Lower levels can concentrate on 'tagging' dying dwarves for a high kill rate. If you haven't already, read the above Life-Saving Notes! These noticeable things and glitches may kill you in a matter of seconds if you are not careful. Stand at the yellow point in the picture. The purple dots are Dwogres. This spot is out of melee range of all the Dwogres and can make sure you are not attacked by more than one hand cannoneer in case the Red Axe side is aggressive. Remember not to stand too close to the west side of the battlefield and you will be safe. Guthan's Armour often heals you but don't rely too much on it. Even if you have a decent Defence level, avoid being piled by staying at the east side of the battlefield. You can now attack everything you want in the battlefield without risking your life. Concentrating on cannoneers being attacked is wise, but make sure you swiftly flip on your Protect From Ranged prayer when they attack you. When you notice that the cannoneers are changing their target, try to attack them from the back. Rangers should change their weapon to Knives or Darts now. Meleers can also use them to finish off the dying level 68 Chaos Dwarves. The only non-attackable NPC in the area. Talking to her will provide information on the Chaos Dwarves, Hand Cannons backfiring and exploding, and the Dragon Pickaxe. Battling the Chaos Dwarves to prevent an invasion of Keldagrim. They greatly draw the attention of the Chaos Dwarves so it is wise not to make them aggressive. The finest warrior among the Black Guard force. They are very powerful for their combat level, similar to 'Pure' players. You can find a few of them at the east side of the battlefield. Low levels can lead Chaos Dwarves to them for faster kills. Trained to use ranged attacks. Several of them attacking a common enemy may result in massive damage, they are as dangerous as cannoneers when they are aggressive although their max hit is only 100. Produced by the Red Axe. Contrary to popular belief, they actually drop Dragon Pickaxes with similar drop rate to that of cannoneers, just slightly lower. If one is only interested in getting a Dragon Pickaxe, it is recommended to kill them as they are the easiest to kill among the Chaos Dwarf side. Also produced by the Red Axe. They are known for hitting over 300 so extra attention is required when confronting one alone. They are the only monsters in the area which drop Hand Cannons and Hand Cannon Shots. A combination between a Dwarf and an Ogre, and the latest experiment of the Red Axe. They use a melee attack and an accurate magic attack. They seldom move when engaged in combat and use their magic attack once you leave their melee range. Be careful if you are wearing armour with negative magic defence bonus. Their drop rate of Dragon Pickaxe is the highest among all monsters of the Red Axe side. They are never aggressive and attacking them will not result in aggression of the Red Axe side.